Is David Godfrey aware a Mediator was not assigned by the Provincial Government? Is David Godfrey aware KIP cannot be the purveyor of water using an aquifer as confirmed by Mr. Cherry of VIHA at the meeting? What proof does David Godfrey have when he claims “Since that time, this board has been anything but accountable to anyone; certainly not to the majority of landowners they represent.”? Give some examples. The Board was elected in 2011 when you were turfed out. So how many times did you have problems? Why does David Godfrey question accountability when he and his KIP supporting Trustees locked out the electorate from January 2011 through April 2011? David Godfrey likes to take credit for that expired agreement that was negotiated without the knowledge of all the Trustees, and all this done while we were locked out. I don’t recall any other Board locking out the electorate without the authority to do so. See below the Ombudspersons Office comments regarding this unlawful closure. 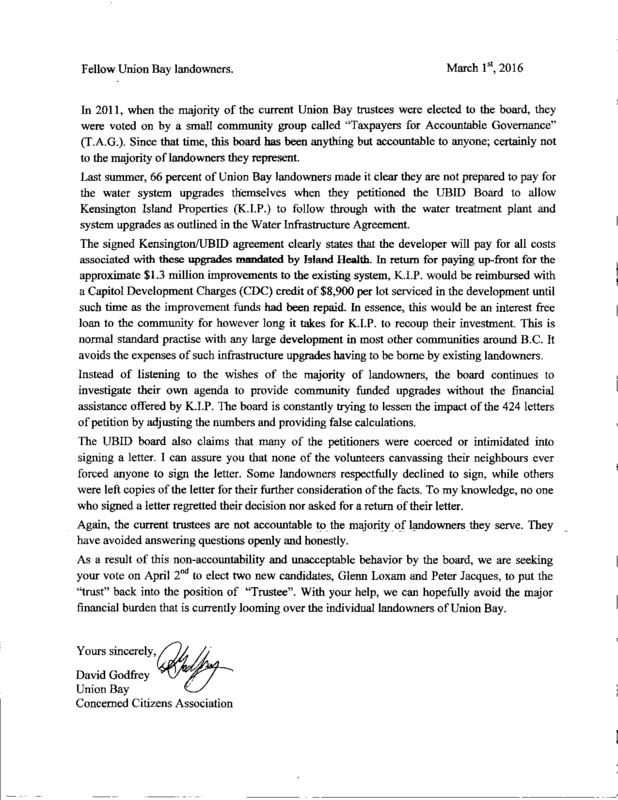 Why did David Godfrey negotiate a deal with Kensington Island Properties that stipulates the developer would receive CEC credits for a temporary system on the Developers land which Union Bay would not own until a permanent facility was up and running? Why did David Godfrey negotiate a deal with Kensington Island Properties that specifically excludes any infrastructure costs related to Langley Lake and the dam? Why did David Godfrey negotiate 500 connections when it was to be 100? Why did David Godfrey negotiate $1.3 million (in CEC’s) which covers roughly 150 connections instead of 500 x $8,900. = roughly $4.5 million? 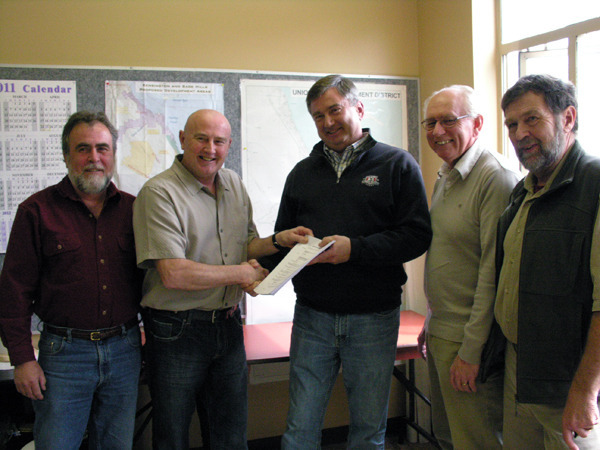 Why did David Godfrey negotiate 500 connections when our water license is good for only a total of 1045? Godfrey’s negotiation bumps it to over 1100. Why did David Godfrey negotiate with Kensington Island Properties and not advise two of the Trustees until presenting them with a draft of the agreement? Why does David Godfrey think he’s in a position to preach to Union Bay about accountability? Why does David Godfrey fail to acknowledge the last Board brought this community’s finances back from the brink of financial ruin left by the Board he was a member of? Why does David Godfrey think it’s fine for an elected official to negotiate a contract with a developer? Please give me some examples of this being an acceptable practice? It appears Kensington Island Properties has coached individuals into KIP’s questionable ethics. Regarding the locking out of the electorate – no action was taken because those who locked us out were voted out or resigned. During the Ombudspersons investigation they tried to change the bylaws to give the chair unprecedented powers to close the doors to the public by decree! When we reviewed the meeting minutes we could not find a formal motion to close the meeting to the public, so we asked the district to provide us with its relevant decision-making records. Initially the district said that a popular reference guide, Roberts Rules of Order, mentioned in the district's Meeting Procedures Bylaw, gave the chair authority to take meetings behind closed doors. In addition, it responded that in its view, “resolutions” to close meetings could proceed entirely via email exchanges which were themselves not accessible to the public. At this point in our investigation, an election took place. The district, now with a new chair and board makeup, agreed to ensure all regular board meetings were open to the public and to make public the minutes of the previously closed meetings. 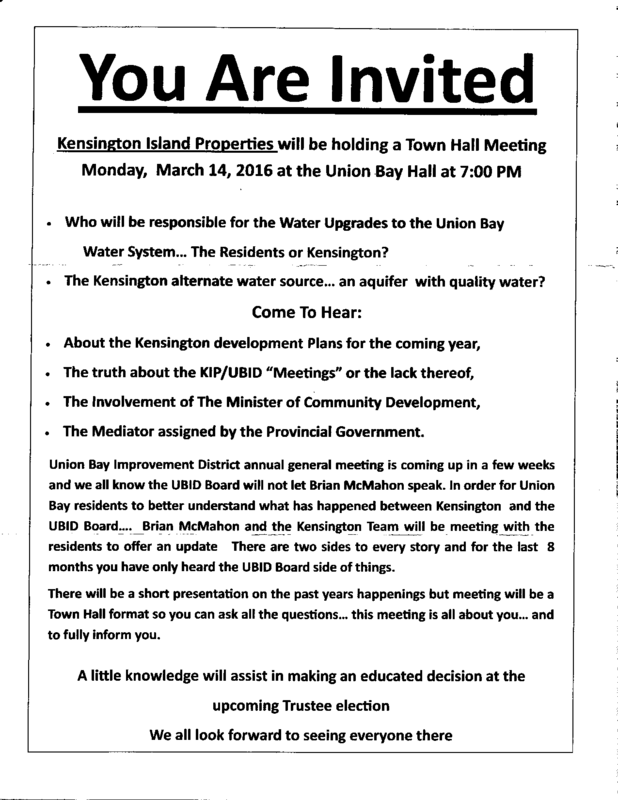 Next Post This Is The Type Of Thinking That Destroys Communities – Is Union Bay Next?